Sorry, I just couldn't help the bad pun. I don't use my Discover it® card a lot, but it is one of my favorite secondary cards and I think it is one of the more underrated credit cards out there. When I do use it, I get fantastic cashback percentages in small spurts and I'll show you how to do the same thing and you may find yourself using it even more frequently than I do. Since the start of 2013, I have put only $148.66 on my Discover it®, but I have managed to get back $12.50, which is 8.4%! Not too shabby! Shop Discover is one of the better shopping portals. Whenever a merchant works with them, it is usually one of the highest cashback percentages. Despite this, lately, I have found myself using Shop Discover less and using Top Cashback more. Most of the time they will give the same percentage back and I would rather use my Fidelity American Express to pay and get 2% cashback in addition to whatever Top Cashback gives me instead of the 1% cashback from Discover. My wife has wanted me to get a new pair of sneakers for about 3 years now so I bought some New Balance sneakers from Sears that I had noticed on slickdeals for $40. 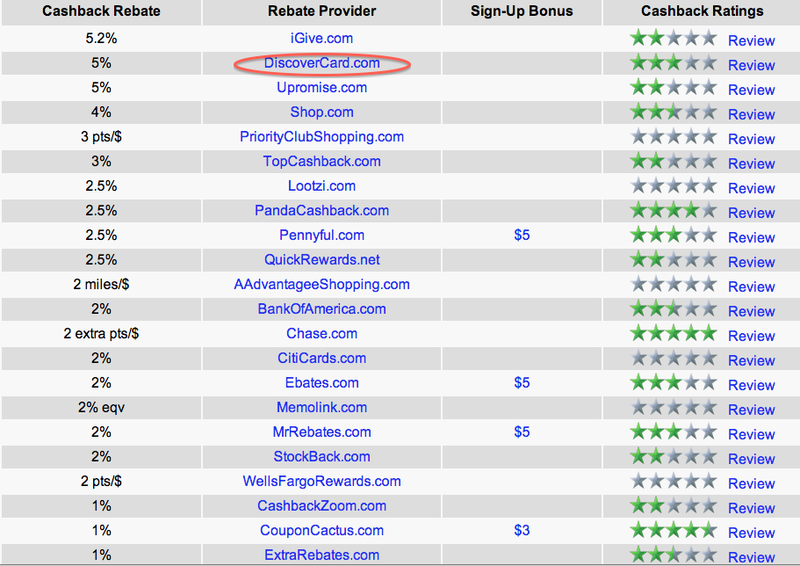 Top Cashback was offering 5% back from Sears, while Shop Discover was offering 10% back (It has since gone back to 5%)! Parenthetically, this was a great deal. They started at $40. I was able to get $5 off by using any amount of Shop Your Way Rewards, which normally gives you the equivalent of 1% back. After using my existing rewards the final price came down to $32.13 and I got 10% back from the original price before any rewards ($4 instead of $3.2). I got my regular 1% back for using the Discover it and my final price became $27.80 after taxes, instead of $40 before taxes. This is exactly 33% off. Staples ran $10 off a $100 sale on everything online last month, including visa gift cards. I bought $100 of visa gift cards for $101.90 and got $5.10 from Discover (5%) for a final price of $96.80. I then used Bluebird to flip that $100 into paying my credit card bills, generating $3.20 cash and another $0.96 from Discover (1%). Discover more is the old version of this card and it collected dust in my drawer until they changed to Discover it®. The cashback went from 0.25% up to 1%, in line with other cards so even if you use it for non 5% categories or internet purchases, you still get your regular 1%. I still basically only use Discover it® for 5% categories (Home Improvement until the end of June) or when Shop Discover gives the best cashback option. Even though I spent $150, I was able to redeem $100 for cash and still get the same amount of rewards. My cashback % moves to 12.5% and with the 25% bonus, that's actually 15.62% - Not too shabby at all! It is nearly impossible to always remember which shopping portal pays the best for each store and when to use Shop Discover, when to use Top Cashback and when to use Ebates. Even if you could remember, they are constantly changing. I use Cashbackholic (no a after cashback). You can search for the store you want and compare the different payouts of various shopping portals. They are constantly updating as well and I have found their numbers to be quite accurate. Barclays NFL Credit Card - $400 Sign up Bonus! Teaneck, NJ Here We Come!